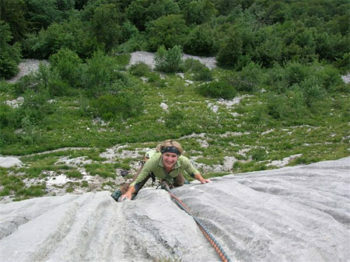 Mont Blanc Granite climbing course. A 5 day course, €2100. This fee is for one person alone or shared between two. 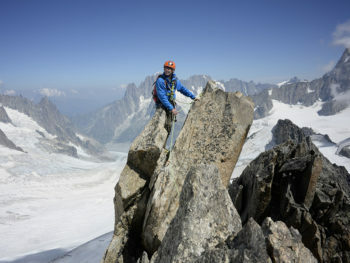 On the flanks of Mont Blanc there are some of the best quality granite climbs to be found anywhere in the Alps. 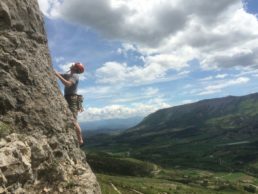 This course is meant as an eye opener to what climbs there is on offer, and the different styles of climbing: friction, laybacking and jamming. 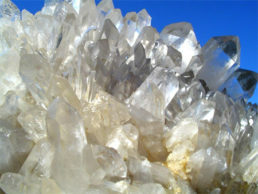 Granite is often a more physical type of climbing than limestone which is found in the lower Pre-alps surrounding Mont Blanc. Both types of rock I find are equally satisfying and interesting to climb. Often on these granite climbs the protection is “trad” which means the protection is placed by the leader when climbing a pitch is in the form of nuts eg: aluminium wedges and caming devices contrary to fixed bolts as it always is on limestone. 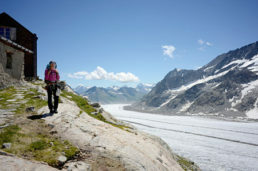 Three of the nights during the course are spent in a remote mountain hut far from the bustle of the main visited summits. There is a certain awe when climbing on these faces with the glaciers and valleys which drop away below you. Day 1: A warm up day at Arnad which is situated in Italy, just south of Aosta. 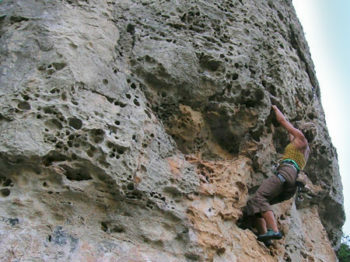 Arnad is a sports climbing venue with single pitch and multi-pitch options. The night will be spent in a charming Gite accommodation in the village. Days 3,4 & 5 Based at the Dalmazzi hut, every day climbing superb long granite routes. Level: Some rock climbing experience prior to course is ideal – should be able to second English vs or French 5, though this course is also open to total beginners. If you have some climbing experience all the better. Guiding Fee: Euros 2100 for five day course. Guide/client, ratio max 1/2. This fee is for one person alone or shared between two. Accommodation – I am happy to suggest accommodation. Transport – We generally try to car share. 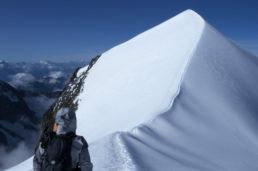 The guide’s accommodation and meals when not based in the Chamonix valley.